We are familiar with office hours and it means the specific time of day when business establishments or offices are said to be open. The common office hours that we know is the time of day between 8 a.m. to 5 p.m. Other may even go as late as 6 p.m. and others even include the time when they close for lunch. Office hours are always displayed in places where it is visible to a lot of people, like the entrance to a store or at the doorway of an office. You may also see sample work schedules. It is important that office hours be made available to the public, especially in government offices and business offices to make people of ware of it and so that they can do transactions based on those office hours instead of making guesses. Office schedule samples and templates are included in this article to help us better understand what an office schedule is all about. You can check them out below. What Type of Schedule Does an Office Schedule Belong? Schedules are grouped into two. They are publicly available simple schedules and internal schedules. For us to be able to determine which type an office schedule belongs, it is a good start to know what the two types are. They are provided with the intention of minimizing inconvenience and for the sake of disseminating information. schedule of activities of a government program. 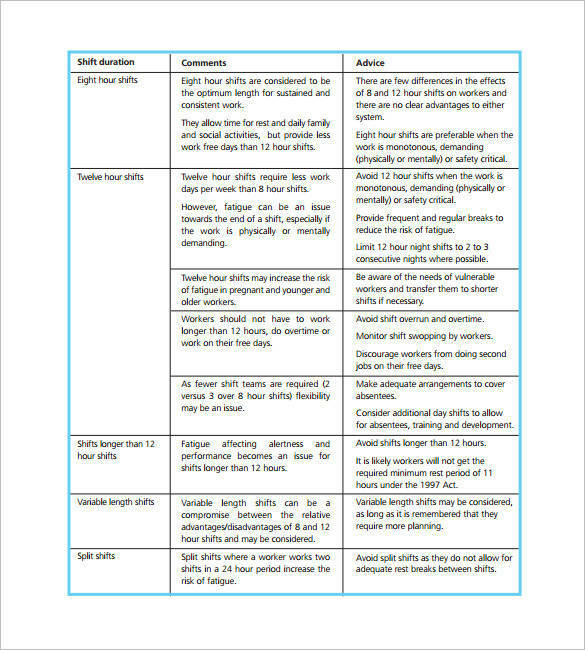 You may also see rotation schedule templates to download. So what type of schedule do you think an office schedule belongs? It can actually be both a publicly available schedule and an internal schedule. It just depends on the entity who is going to use them. The office schedule of a mall or a business is considered a publicly available schedule because it should be made known to a lot of people. However, the office schedule of the CEO or the president of a business may not be always made known to a lot of people. Sometimes, only their secretary knows about it and not all employees are informed. So this office schedule is considered as an internal office schedule. You may also check out interview schedule templates. 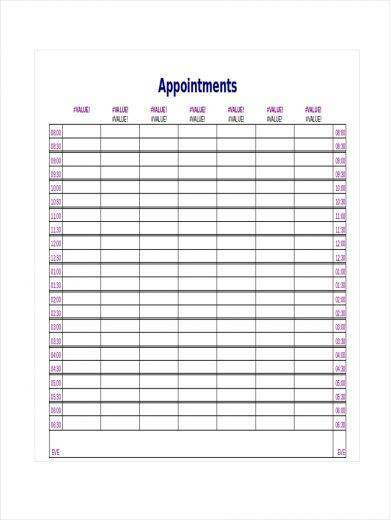 Other schedule-related topics you might be interested in are appointment schedule samples and templates, staff schedule templates. What Are the Uses of a Schedule Template? There are many things that one can use with a schedule template. Different varieties of office schedule templates are being used by different entities on a daily basis depending on their needs. Because of this, schedule templates have come to be used in a variety of things, whether they are about personal stuff or business-related tasks. We have a list below of the uses of a schedule template. 1. A schedule template helps you organize your day-to-day personal tasks, appointments, and other activities so that you can attend to all of them or be able to set a specific time for all of them in your very busy and action packed schedule. 2. Schedule templates keep you reminded of what tasks or appointments you already have planned or scheduled for a particular day so that you won’t ever forget them no matter what you do. 3. 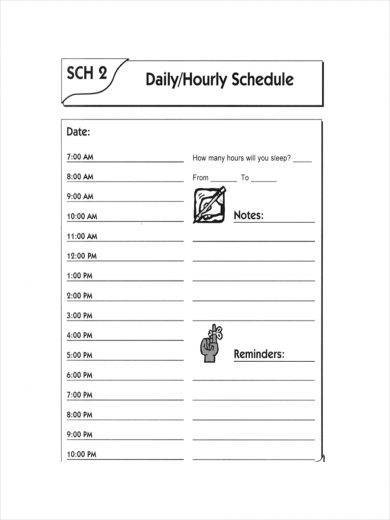 Using a schedule template as an activity schedule for your kids or as a toddler schedule will make it easy for you to help them establish a daily routine that is appropriate for their age. 4. Planning is important in everything that you do and a schedule template allows you to do just that. With the use of a schedule template, you can plan the things that you must do and make it so that you have enough time to do those future commitments. 5. Another important thing that you will learn to do in a schedule template, aside from planning, is the prioritization of tasks. In order to get things done on time, you will need to prioritize your task by making sure that important ones or those with a deadline coming up are done first and those that are not that important are done later. This is just like what you would do in checklist templates like daily checklist templates and cleaning checklist templates. 6. A schedule template can help you with managing your time effectively so that you can become productive with work and still have free time to enjoy yourself with other personal things. 7. A student schedule is also useful for students who are having a hard time keeping track of the things that they need to attend to in school. 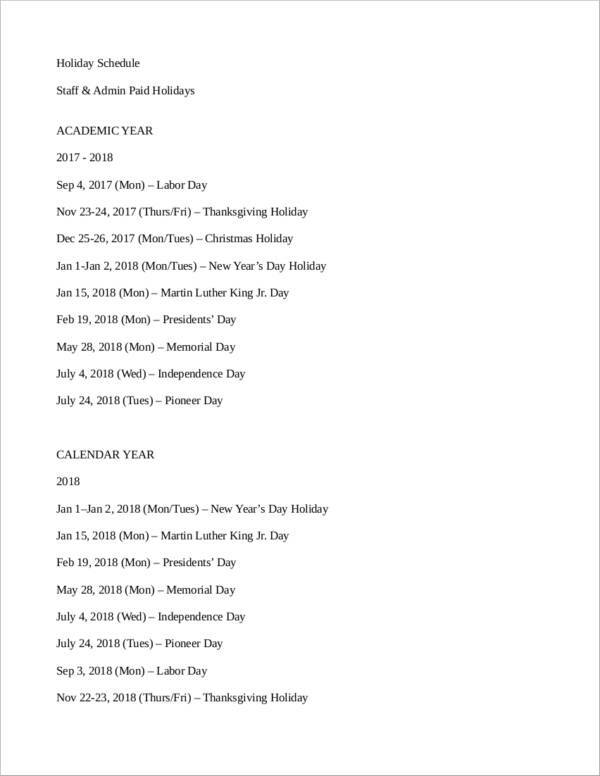 There are also specific schedule templates that can help them with any school-related stuff, such as homework schedule or assignment schedule, and test schedules. 8. 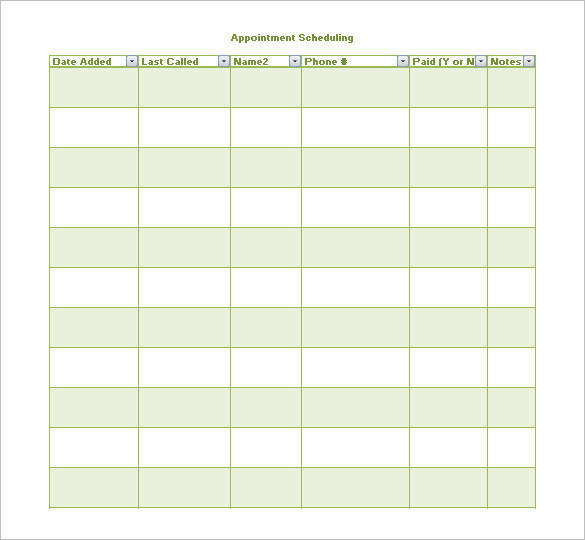 You can easily schedule appointments and meetings without overlapping schedules with the use of schedule templates. This is all because you can see what has been plotted or scheduled on a specific time and day and that tells you not to schedule another appointment or meeting on the same time and date. It sure is easy to make your own office schedule template. And we mean the entire office schedule, not just the office hours posted in entrances. To help you get started, here are some very easy steps that you can follow to make your very own office schedule in Excel. 1. Since you already know that it is an office schedule you will be making, you will first need to gather the details that you will be putting into your sheet. Examples would be the office hours of the store, the holiday schedules, the weekly work schedule, etc. 2. Once you have gathered everything that you need for the details and such, the next step would be making the draft or an outline of how you want your schedule template to look like. Keep in mind that you are going to make it in Excel sheets, that way you won’t make an outline that cannot be done with Excel. 3. You can use old office schedule samples that your office has used before. It will help you easily gather just the right information that you need. You may also see employee schedule samples. 4. Making a draft before actually starting with making one in Excel will make the entire process easy and convenient for you to do, aside from the fact that it will also save you a lot of time. 5. When your draft or outline is done, you can finally proceed with preparing the equipment you need to do the actual office schedule. You will need to turn on your computer or laptop and your printer. You may also like staff schedule templates. 6. Then launch the Excel application that you can either find on your desktop or in the programs from your Start menu. After launching, it will prompt you to select on the templates it has available. Choose the blank template, but you can always use the other appropriate templates if you already got the hang of it. 7. A totally blank spreadsheet will appear in front of you occupying your entire screen. You will see line after line after line, and tons of columns and rows. 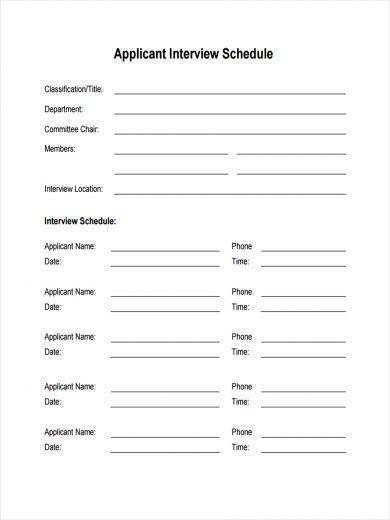 This will now be your working sheet. 8. Next, have your draft of template positioned near your computer or laptop screen or in a way where you can see both your Excel sheet and draft without having to move your head left and right. 9. With your draft as your guide, transfer each item or every detail from your draft to your actual working sheet and arrange them as you did in your draft. This may take some time, especially if you are pretty new to Excel. Just take your time and don’t be in a rush as you might forget something. 10. After completing the transfer, you will need to review your work. Also have somebody review it for you. Check if there are any dates that you have entered incorrectly or if you have typed in the wrong time for a particular day. This is an important step as the office schedule you are making will be used by the employees in your company and making any mistakes might have a bad impact on your business. You may also check out university schedule samples. 11. You may also make changes or revisions to your document by this time. 12. When you are satisfied, it is finally time to save your work. Go to the File menu and then select the Save option. A small window will pop up and show you the location where your file will be saved. If you don’t want that location then you may go ahead and change it. A default file name will also appear at the bottom. You can change it to the file name that you want and then click the Save button at the bottom right of the small window. You might be interested in sample production schedule templates. 13. You will know that your file has been successfully saved by checking it to the location you changed it into or by checking if the file name you have entered is already displayed at the top center part of the Excel application. 14. Now, the next thing left for you to do is get approval from somebody higher than you or from your human resources staff. There are surely tons of ways on how you can create an office schedule template, not just in Excel but also in different available applications. You just need to learn the steps that you find easy to do. If you find the steps above useful, then you might also be interested in other step-by-step articles we have on our website such as How to Write a Statement of Purpose, How to Obtain Permission to Use Copyrighted Material, and How to Write an Advertisement. 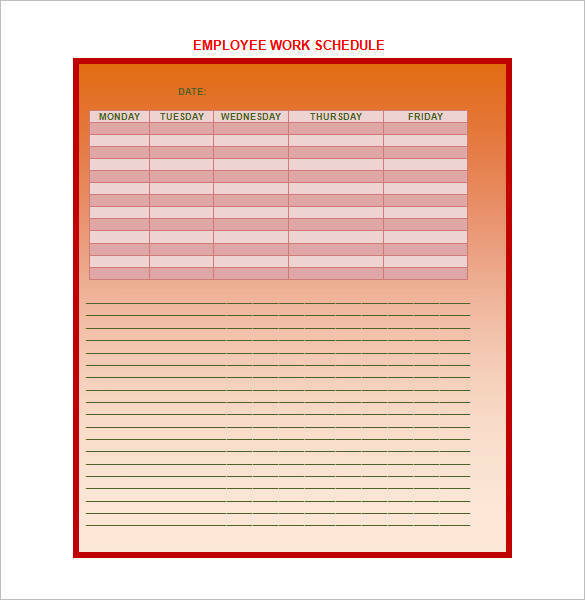 More than just using and making an office schedule template is the way an office schedule is being utilized. This is basically how you can determine if the office schedule you have created is effective or not. It is because even if you have the best template, it can never help you unless you try to use it correctly. Here are some useful tips that can help you do that. You may also see appointment scheduling samples. 1. Require that all your employees check the office schedule. It is not because you made it but because it will keep them reminded of work schedules, tasks, and deadlines that they have to meet. It will also help office staff to do things in an organized manner. You may also like sample class schedules. 2. Email your office schedule to all of your employees so that they can have their own copy. If possible, also post the schedule on your bulletin board or in places where they can easily be seen. 3. If there are any disputes from your staff or employees and you need to make changes, work on them right away. Also send an email about the changes and why it has been done. 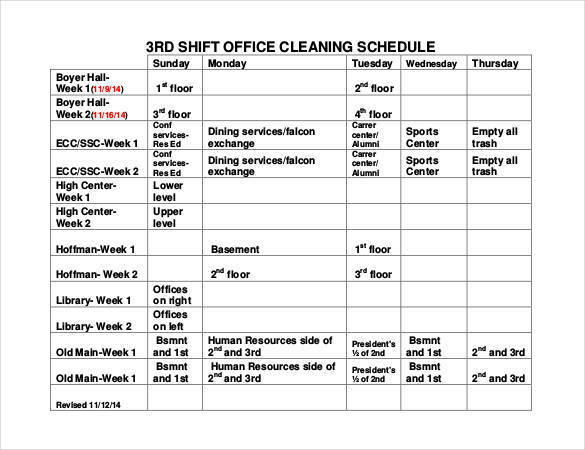 Take out the old office schedule that you have posted and change it with the updated one. 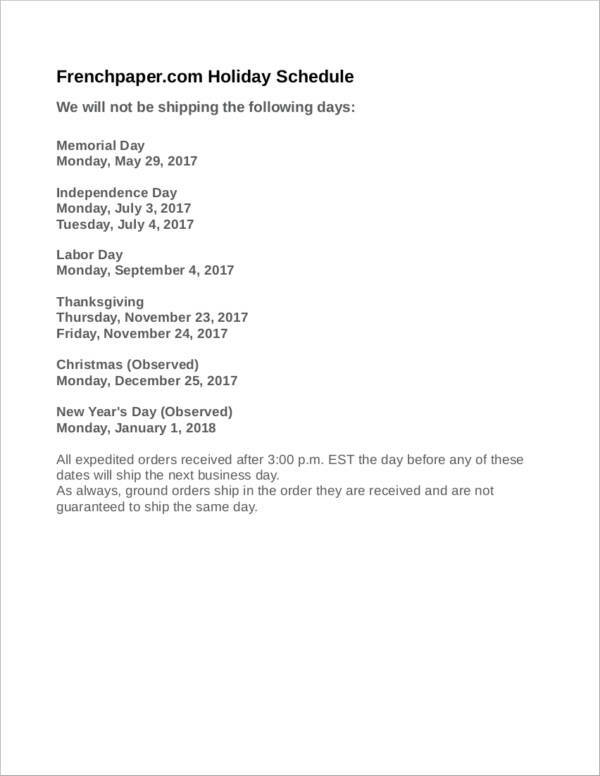 This is so that your employees will not get confused as to which schedule to follow. You may also check out weekend scheduled samples. 4. Set an example. In order for your people to follow you, you should show them first that you are doing it. This is perhaps the most convincing and persuasive way for you to do things. Your employees will follow your lead and your success rate will be a guaranteed 100 percent. You might be interested in conference schedule samples.